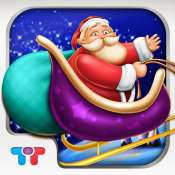 El cuento de Santa Claus en un libro interactivo que nos recuerda cu�nto falta para el d�a de Navidad en una cuenta atr�s. ??? Voted the Very Best Multimedia Book for 2011 Christmas! ??? ??? 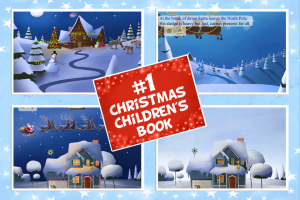 A Christmas Tale Comes Alive in A Spectacular Interactive Storybook ??? ??? A Revolutionary Reading Experience for Christmas & the Holiday Season! ??? Visit Santa�s home and help Santa, his wife and the family of elves count the days, hours and minutes till Christmas. Find the Christmas tree in the family living room. Decorate the tree and you�ll find that the ornaments� bells are a Christmas piano. Use the �Send to Santa� feature to articulate the holistic notion of a wish.
? Fantastic HD illustrations covering all book pages.
? Numerous, engaging and fun activities on every page - reveal an enchanting reading experience never seen before on iPad/iPhone.
? Take your time and find all the joyful interactions in every page. For assistance choose �Tips� from the menu and reveal all the hidden features.
? �Auto Play� - reads the story to you and automatically flips the pages. 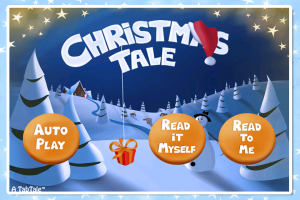 Christmas Tale is part of an amazing collection of unique, rich and intensely interactive children�s story books by Tabtale LTD. If the sound isn't working, make sure the mute switch is turned off, activate the application, then turn up the volume and the sound will work (you can find the mute switch and volume button at the side of your iPad/iPhone/iPod Touch). 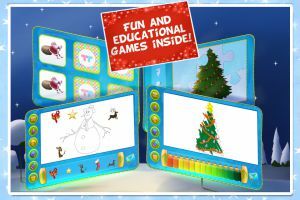 Enjoy our NEW fun and educational games! with the story and can help stimulate your child�s mind.
? Paint-a-Picture - Dozen of coloring pages and a rainbow of paints. Get crafty with your kids. Share your masterpiece with friends!